I had big plans for this little dish, but at the last minute I didn’t have enough time to make individual chard packages of warm goat cheese, so I went in a totally different direction. It’s way into beet season, so I had to get that on my menu, but the other ingredients were a nice combination of what I had in the house and what ingredients I used only half of for the other dishes. It made for very little waste without making anything too similar on the Middle Eastern Menu. Roasted Beets: Preheat the oven to 400. Wash the beets and trim the greens off. If you grab beets with the greens, save those to steam too. Place the beets in a 9×13 pan, sprinkle with a splash of olive oil and a sprinkle of salt. Pour in about 1/2 cup of water and then cover the pan with foil. Roast for about 45 minutes to an hour. There are several ways to roast beets, but I like this simple and fool-proof method. When the beets are tender and a knife easily slides through the beet, they’re done. Remove them from the oven and set aside. When cool enough to handle, rub the skins off the beets. This should be easy. Chop the beets into small chunks for the salad. Steaming the greens: Wash the greens very thoroughly. Run a bunch at a time under water to remove all the dirt. Steam the greens, a bunch at a time for just barely even a minute. With tongs, remove greens from steamer or pot and place directly into a colander and cover with ice. When the ice has melted and the greens are cool, chop them into small 1-2 inch pieces. Take a handful of greens at a time and squeeze ALL the water out of them. You won’t ruin the greens by squeezing too hard. Place in a bowl. Ana Sortun, of Spice suggests placing the chopped garlic in a bowl with the lemon juice and salt to take the bite and heat our of the garlic. Set aside for about 10 minutes. Stir in the yogurt, olive oil, and black pepper to taste. Fold in the dill. If using cucumber, fold in about 1 cup chopped cucumber now. Season with salt and pepper if more is needed. 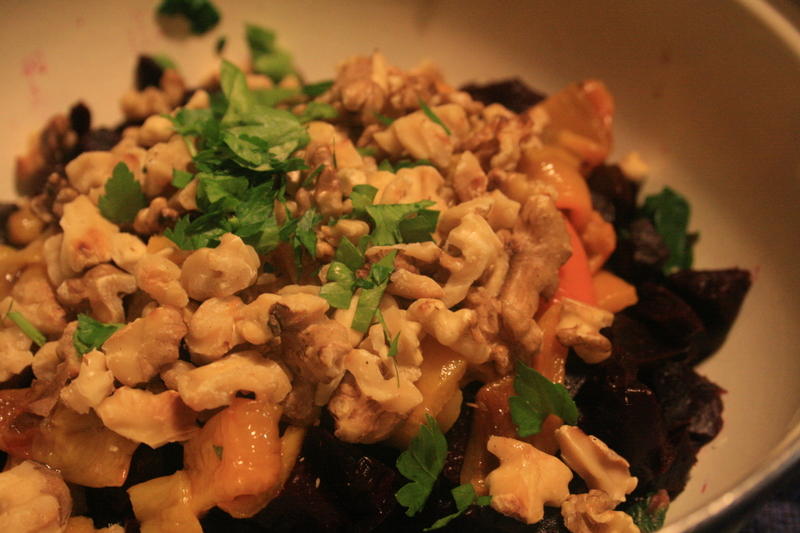 When you’re ready to put the salad together, pile the beets on top of the greens, then the chopped walnuts, and if using, place the chopped roast bell peppers too. Place dollops on individual servings or on top of the walnuts to serve. 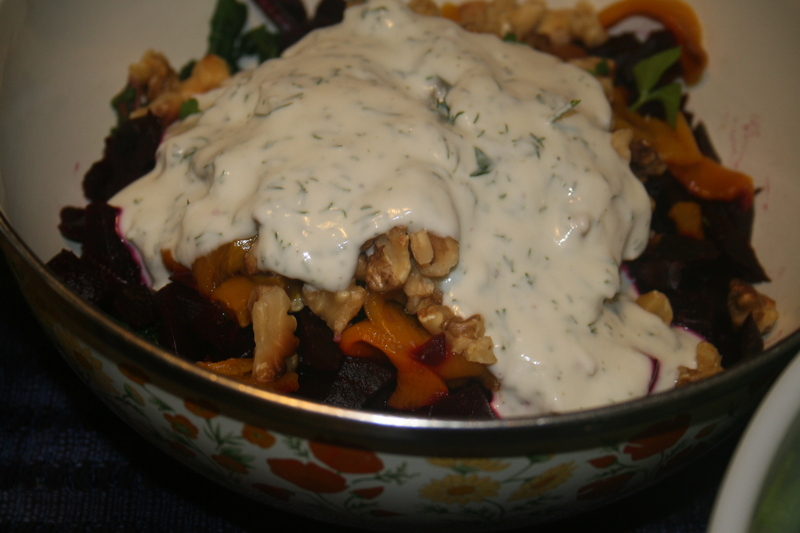 This entry was posted in Dietary Restrictions, Recipes, Salty and tagged Dressing, gluten free, Goat Cheese, Sides. Bookmark the permalink.